Published June 24, 2011 By Anna T. This post may contain affiliate links. Regardless, I only recommend sites I've researched and/or used and trust. When you're looking for ways to work from home, at some point you'll undoubtedly come across home assembly jobs. These jobs sound really intriguing — especially to people who are “crafty” (unlike myself!) While it's true that these craft assembly jobs aren't necessarily all scams, I still do not recommend them to people who come here looking for ways to earn money at home. I got an email just last night from someone inquiring about a certain company offering this type of work, and I guess that's what got it on my mind, so I thought I should just address the issue openly here. Please note that by “home craft assembly” I am not referring to making and selling crafts. I'm referring to these companies that promise to set you up with your own work at home craft assembly job, providing you with materials and instructions for making crafts in exchange for a startup fee. This doesn't vary much from company to company. Basically, you have to initially pay for a starter kit containing everything you need to make your first craft. The kit usually comes with the materials you need to make the craft, a completed product to compare your craft against, and possibly even some instructional DVD's to watch. The cost of the kit varies from company to company, and some do offer money-back guarantees that you can take advantage of within a month or so if you decide you're just not cut out for the work. You make your first craft according to the instructions you're given and send it back to the company to inspect. You may or may not be liable for the cost of shipping your craft — this also varies from company to company. After they receive your craft, they look it over and determine whether or not it's up to their standards. If it isn't, they'll send it back to you so you can try again. If it is, you can start working. You'll submit a certain number of crafts per week and will be paid per piece for each one you do. Related: Make Your Own Crafts & Sell Them On Etsy! So, this all sounds like a pretty incredible, easy opportunity to work at home, huh? Well, if only it actually were. Nine times out of ten your first craft will be rejected. And most of the time your second and third efforts are rejected as well. In fact, there are some people who can't get their crafts approved no matter how hard they try — many of whom claim that their finished products match the samples exactly and in some cases look even better than the samples they were sent to compare against. This makes me very, very suspicious. The end result here is that you've paid for this starter kit and also possibly spent money on shipping for sending crafts to this company, but you have no money yourself to show for all your hard work. And you probably won't because chances are good that by now you've gotten disgusted trying to please this company and given up on the whole thing. A lot of time wasted and money spent for no reward. This is why I don't recommend home assembly jobs– because this seems to be the story all too often. And believe me, I have looked over lots of job review boards for some good feedback on many of these places, and the good feedback was so few and far between that I finally came to the conclusion that most of the time, people who attempt home craft assembly come out on the losing end. Are Home Assembly Companies Trying to Scam People? Not all of them. Technically, there are two that might be legit. And I definitely don't feel comfortable recommending them, either. And it's worth noting that some of these companies are justified in charging for their starter kits because I get that they can't really send people all this stuff for free when there's a chance the would-be workers might decide not to bother with it. That would be a lot of money lost on their end. However, I hate the fact that so many people lose so much money trying to get involved in this with no idea of what it actually entails. It's not instant cash — it takes time to get your starter kit in the mail, make the crafts, send them back, wait on approval, then probably get your samples rejected and have to try again. Once you get approved to begin working, you'll probably be pretty slow at the whole process, which means you'll be lucky to earn more than $3 or $4 an hour. And then there's the waiting game again with shipping stuff back and forth and also the likelihood that you won't get paid for every piece you send in because some won't be up to standard. The bottom line here is I don't like to see people lose money when they don't have it to lose. I can't deny the fact that some people are assembling crafts at home and earning money. You can read this thread on home craft assembly jobs at WAHM and see that for yourself. And if you're one of those people, please don't get upset by this post. I'm not slamming on what you do. If this work is helping you to provide for yourself and/or your family, then I'm glad. I just want to make sure that people who are considering it know what they are getting into. If you look closely at the thread I just posted above, you'll find many people claiming to have been scammed. No big surprise there as the majority of these companies actually are scams. This is why you have to be very careful when getting involved in things like this. 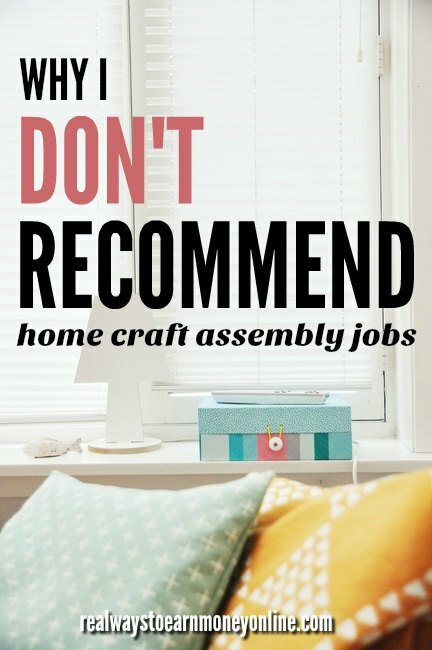 So you're a crafty person and you think that home assembly jobs would be ideal for you because of that. Well, here's an even better idea: Make and sell your own crafts!! And if you don't know how to make crafts, take a free online class at Craftsy to learn how. Why let someone else pay you next to nothing for your unique talents when you can earn much more? If you can make things, you can sell them. Believe me, there's a market out there for you somewhere. You can test the waters by taking pics of your crafts and uploading them to sites like Etsy or Artfire. On these sites, people are actually looking for things that are handmade. If you'd prefer not to bother with the computer, you can try selling at flea markets and craft booths. You can likely earn a lot more money for a lot less hassle. I saw a program once where the producers enlisted the help of professional crafts artist to assemble some crafts purchased via work at home opportunity, to flawless completion. Those items were still rejected as being not up to standards. Conclusion: the only people making money are the ones selling the kits. I totally agree and I have seen very few opportunities that are actually legit. However, sites like Etsy.com can be a great way for crafters to market their own products. The assembly “opportunities” are a well planned out scam that unfortunately draws a lot of people in. The places that do pay tend to make it next to impossible for the submitting crafts to be acceptable. GREAT GREAT GREAT post Anna! Way back in the early days, when I first began to look for ways to work at home, I almost ordered a starter kit to try and do this type of work, too. The company I was considering made it sound so easy — like anyone could do it — and I nearly bought into it. I am SO glad I didn’t do it!! That’s such a great article and I have heard of it WFH craft assembly and thought “maybe I should look into it”. But after reading this and other people’s thoughts, I decided that maybe my crafts should stay mine. Thanks! They definitely should, Angela. Use your talent for making things for yourself — believe me, you are probably much better off.